Lane Cove Council Council has met with the Department of Planning & Infrastructure (DoPI) and a comprehensive traffic study of the Mowbray Road precinct is underway. The study will examine, amongst other issues, the potential impacts and constraints to traffic in a fire emergency. The North Shore Times reports on the Threatened species and Endangered ecological communities of the Batten Reserve and how they could be detrimentally impacted by development in the Mowbray Precinct. On Monday the 4th April, the SBCRA coordinated a public rally to raise awareness within the wider community of issues presented within the rezoned Mowbray Precinct. 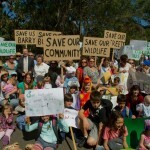 The rally was attended by The Mayor of Lane Cove, Win Gaffney, David Shoebridge, MP from the Greens Party, local Councillors, Ron Gornall, President of the Lane Cove Bushland & Conservation Society and concerned members of the community. The North Shore Times has picked up on the Council plea to State Government to reverse the zoning within the Mowbray Precinct. Lane Cove Council has posted a Media Release in response to the Department of Planning commissioned, Lane Cove Bushfire Accessibility Report. The report was conducted by UrbanHorizon Pty Ltd and has received criticism from Local Council and the SBCRA. The SMH has picked up on the Lane Cove Council plea to State Government to reserve the zoning desicion within the Mowbray Precinct. The plea from Council was in response to the Lane Cove Bushfire Accessibility Report which was slammed by Council.